The year is 1996, and small-town life for 14-year-old Catherine is made up of punk rock, skaters, shoplifting, drugs, and the ghost of Kurt Cobain. Her parents are too busy divorcing to pay her headful of unspent angst much attention. But after she tries a PCP variant called mesc for the first time, her budding rebellion begins to spiral out of control. Acclaimed as the modern-day coming-of-age story for a generation of Québécois youth growing up in the 1990s, Geneviève Pettersen’s award-winning debut novel both shocked and titillated readers in its original French, who quickly ordained it a contemporary classic and a runaway bestseller. Anaïs Barbeau-Lavalette, the hotly tipped Québécois director behind Inch-Allah (2012), is currently adapting the story to film. Now Esplanade Books is honored to present The Goddess of Fireflies to English readers for the first time in a powerful translation from award-winning novelist Neil Smith, author of Boo and Bang Crunch. Geneviève Pettersen was born in 1982. 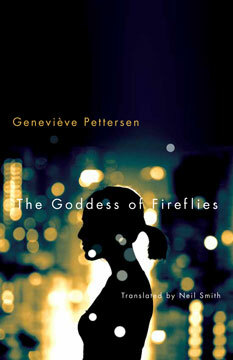 The Goddess of Fireflies, her first novel, was originally published in French as La déesse des mouches à feu by Le Quartanier (2013). She is currently working on its sequel. For years she wrote the widely-read Madame Chose column for the La Presse newspaper which were collected into a book. She is currently a columnist for Chatelaine. A three-time nominee for the Journey Prize, Neil Smith published his debut collection, Bang Crunch, with Knopf Canada in 2007. It was later published in America, Britain, France, Germany, and India. It was chosen as a best book of the year by the Washington Post and the Globe and Mail. His second book, a novel called Boo, was published in May 2015 with Vintage Books in the U.S., William Heinemann in Britain, and Knopf in Canada. 200 pp 8.5" x 5.5"